Serving Merritt and the Nicola Valley for over 20 years. At TBM Cleaning and Restoration Services, special pride goes into every job. We really go that extra mile for our customers - their satisfaction is our reward. We invite you to experience the TBM Advantage for yourself! We are Merritt's most diversified professional cleaning service - we get the job done right. 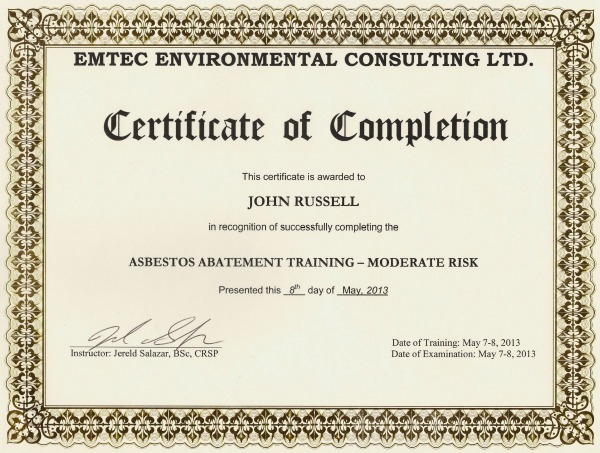 To keep up with our high quality standards and for the protection of our customers, we constantly update our knowledge and expertise - here are some of the certifications we hold. 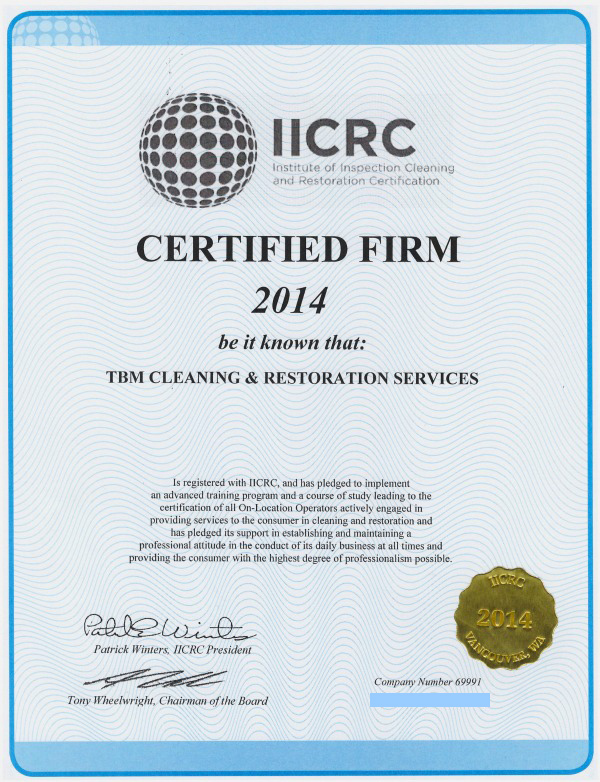 TBM Cleaning and Restoration Services is a IICRC Certified firm. 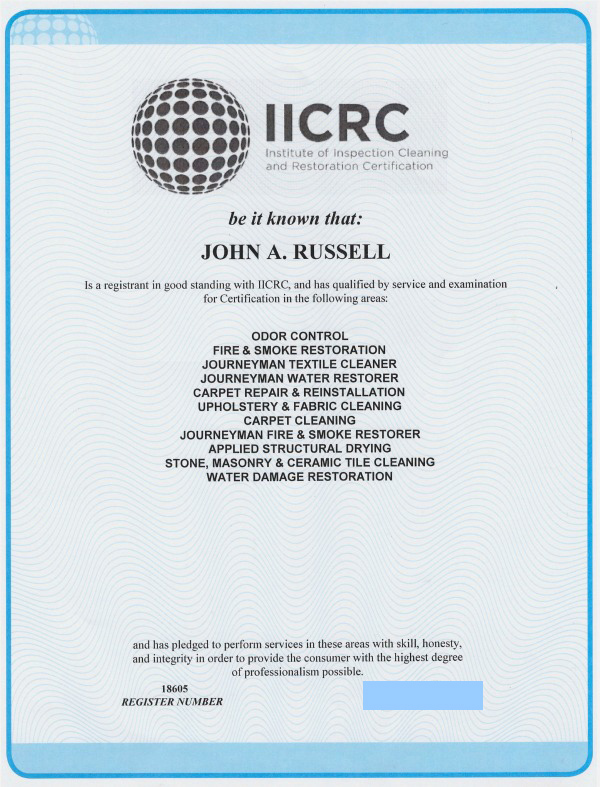 This certification supports and confirms our high quality standards; you can read more about the philosophy and guarantee behind the IICRC Certification right here, and find out about our other certifications by clicking here. Certified firms like TBM have earned the right to display the IICRC logo and symbol of quality. 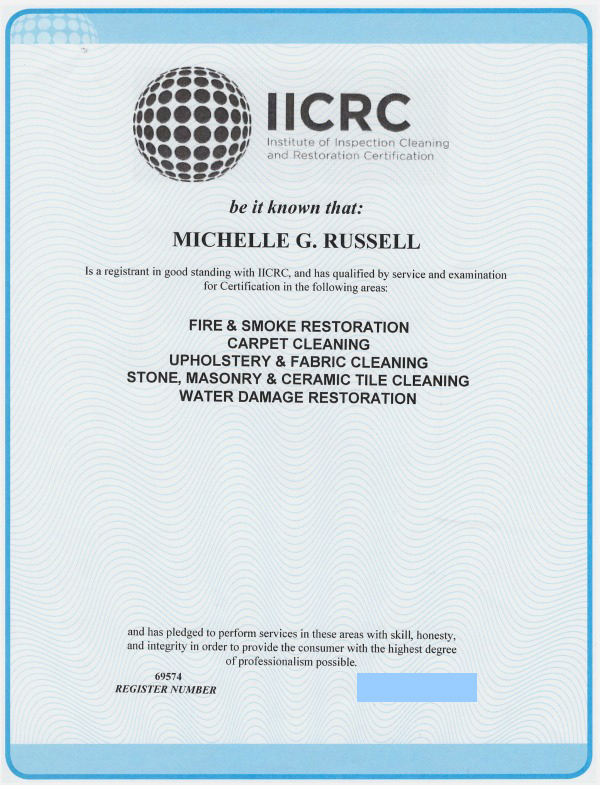 We employ one or more cleaners or restorers who have achieved IICRC Certification through formal study, examination, and practical experience. are trained to identify fabrics and furnishings, to select approved cleaning methods, and to clean your furnishings with maximum safety and skill. When you select an IICRC Certified Firm, you can be confident that an experienced, qualified professional is caring for your valuable furnishings. 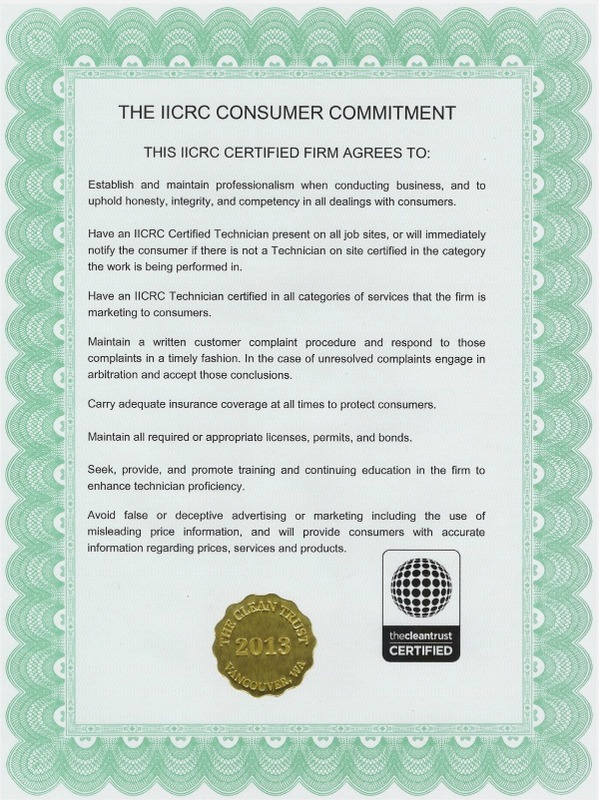 In addition, all IICRC Certified Technicians pledge to conduct business honestly, always making customer needs a priority. TBM Cleaning & Restoration Services has served the Nicola Valley for over 20 years. John and Michelle purchased the company in 1994 and started out with only one van - now, in 2014, the company has grown to a team of 10 and is the most diversified cleaning company in the the Nicola Valley. A wide range of cleaning services and the role as liaison to insurance adjusters nationwide make us the best choice for home- and business owners in Merritt and beyond. 20 years ago we used a portable carpet cleaning machine - which worked fine at the time - but our company grew quickly and the wish to deliver top notch professional service led us to install a truck-mounted system in 1998. This equipment was just another step to becoming the most diversified cleaning company in Merritt. Not only were we able to do a more thorough job, we were also able to take on more jobs and hire more staff, contributing to the growth of our community and providing a reliable work environment for our team. Soon after installation of the truck-mounted system we were able to offer restoration work as well. 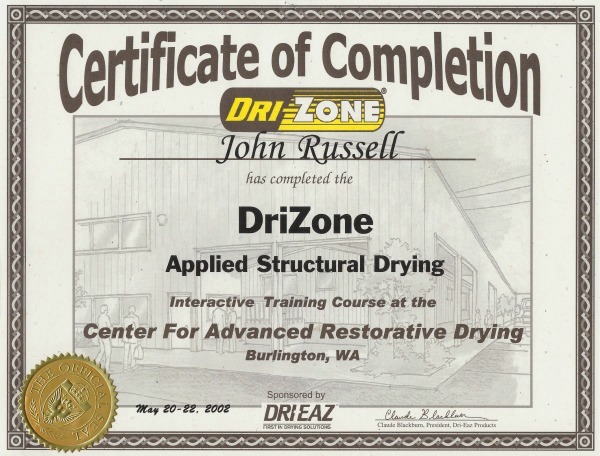 Training and certification of the firm and each staff member followed and more equipment was purchased to take on water damage claims, providing fast and efficient service to people whose home had been struck by disaster. We are constantly staying up to date on the newest techniques and developments and also have specialized equipment like moisture meters for a more effective job - and we continue to upgrade our equipment constantly, in order to keep up with industry standards. With the help of equipment like dehumidifiers and blowers, we get homes and businesses back to normal as fast as possible after water damages - including all necessary restoration and renovation work! 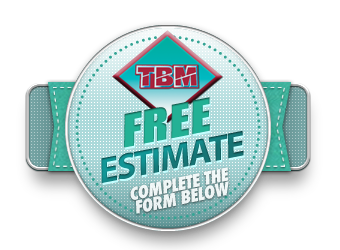 The team at TBM Cleaning & Restoration Services is here for you - for commercial, residential and restoration work. Give us a call or request a free quote (for carpet, upholstery or tile & grout cleaning) today - it's been longer than you think since we last cleaned your carpets! Our Quote Request Form is Temporarily Unavailable. We apologize for the inconvenience. Please call 250-378-9410 and we will be happy to assist you by phone. We need to know where you are. Restoration Services Carpet Cleaning Upholstery Cleaning Tile & Grout Cleaning Commercial Cleaning Other It would help to know what services you require. Please select a preferred date for service.